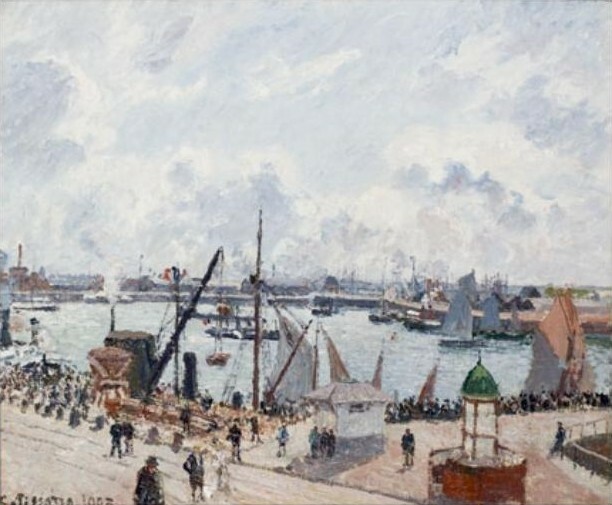 This is one of the paintings purchased from Pissarro by the museum in Le Havre museum. The complex scene documents the heavy traffic in Le Havre’s port. The harbor is packed with boats, and commercial facilities line the water’s edge. The left side of the canvas reveals a red brick factory with a tall smokestack, and billowy clouds fill the top half of the canvas. Pissarro focused on a steamship in the left foreground, which is barely visible behind the huge steam crane discharging puffs of white smoke. A heavy consignment hovers in midair above the dock. The dark boom of the crane draws a heavy diagonal line, which, if extended, meets the top of the ship’s tallest mast. This joined at the bottom with the ship’s deck forms a large triangle that is repeated in the triangular shape of nearby sails. The boom also makes a distinct X with the ship’s lower mast and forms a perfect parallel with a small boom on the ship. This highly geometric construction anchors the painting and provides a stable fulcrum around which the other elements can revolve. Interestingly, the lower mast of the docked ship is flying the French flag. This may have been a local ship, carrying merchandise from the Le Havre docks inland to Rouen or Paris. Just to the right, another small ship in the middle of the harbor is also flying the tricolour. To the left of the first flag, on the distant side of the harbor is a flurry of flags of red, white, and blue. The inclusion of French flags is unusual for Pissarro. We wonder why the anarchist painter included French flags in this particular painting, but it is almost always a mistake to second-guess him. He may have simply painted what he saw that day. PISSARRO’S PLACES was chosen to be an official publication of the Normandie Impressionniste Festival 2013. 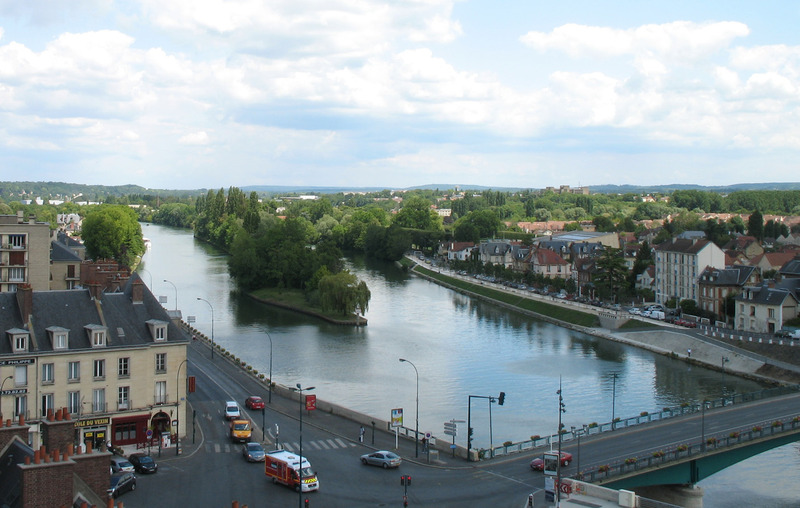 The new website for PISSARRO’S PLACES is now live on the web! Check it out and let us know what you think. There is a link on the website for your comments and we look forward to hearing from you. 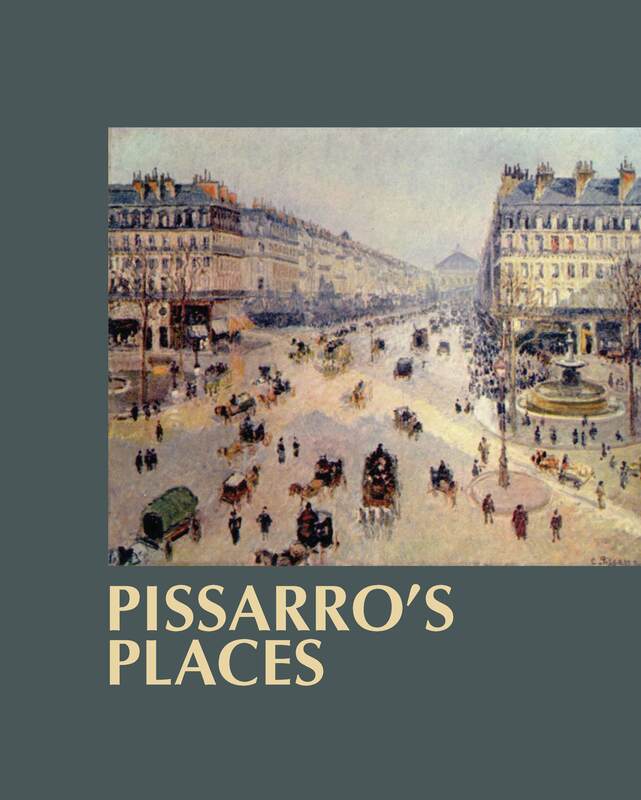 PISSARRO’S PLACES — Announcing the book launch! PISSARRO’S PLACES tells his story in a fresh and different way—exploring the places he painted and his “sensations” as he translated them into brushstrokes on his canvas. In his landscapes, you almost feel the sun and the wind in the trees. In his city paintings, you sense the hustle and bustle of traffic. This was his genius. Rather than settling for the familiar, Pissarro courageously put himself into new situations in pursuit of different and exciting motifs. With PISSARRO’S PLACES, you see those places through his eyes. All the paintings featured in the book are located in public museums and are accessible to the public. The regular list price is $39.99. For the book launch until June 1, the price will be $29.99. or by writing Ann Saul, 225 S. 18th Street, Unit 510, Philadelphia, PA 19103.